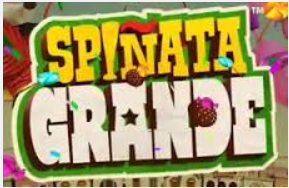 On 23 March, 2015, Net Entertainment released Spinata Grande, its newest video slot. If your idea of having a great casino entertainment is playing online slots with Mexican music, then Spinata Grande is the game for you. NetEnt was established in 1996, making it one of the first gaming software developer in the gambling industry. All games powered by this software are friendly to players with low budget. Moreover, the games are well developed and have impressive jackpot offers for players to enjoy. Spinata Grande features 40 pay lines, 5 rows and 5 reels, with Mexican piñatas theme which is not something new to any online player. The game presents players with cheery piñatas. All the action in the game takes place in an ordinary Mexican town with four main symbols in the game. These symbols include a bird, mustached fish, obligatory donkey,and a bull. Unlike most slots, Spinata Grande does not have a specific pay line structure. Instead, winning combinations occur when player matches symbols in adjacent reels. With the help of Net Ent software, Spinata Grande features amazing animations, upbeat Mexican music, and 3D graphics, giving players a fun experience. When you win big, your screen will be filled with confetti falling from the sky as trumpets play on the background. Just like in other Net Entslot casino games, the rules in this game are quite similar to the land-based casino. This also means that the odds of winning in Spinata Grande are also competitive. Players can increase their chances of winning big through Spinata Grande’s coins. Colossal reels are one of the greatest innovations of Spinata Grande. Unlike other slot games, these symbols are much bigger, covering 3x3 or 2x2 reel position, to enable players land at larger winning combinations. The maximum jackpot that players can land is 120,000 coins. The mini slot feature is another great feature of Spinata Grande. It creates a remarkable gameplay of slot-within-a slot. This feature will be triggered after you land a colossal symbol. As a result, you will get free spins with 2x multiplier. The trigger occurs when the symbols is strike by a bat to spin the reels, which represents free spin symbols. The free spin mode takes place in different screen, setting impressive mega wins that re-triggers colossal symbols. Spinata Grandecan be accessed on both the desktop and mobile devices, making gambling even more easier and interesting. Gadgets running on iOs such as iPads and iPhones, as well as android operating system are compatible with this game. You can look for recommended online casinos powered by NetEnt software like Casino Cruise, Slotty Vegas and Winner Casino to access this game from either your mobile or desktop.